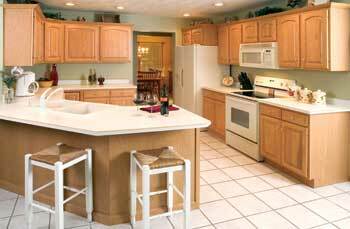 Real wood cabinets by Woodcraft Industries that address the quality and design requirements of home owners, and exceed industry craftsmanship standards. Woodcraft continues to stand for quality and choice. These cabinets are 100% real wood, and available in superior grades of pine, maple, oak and cherry in a broad variety of cabinet sizes to accommodate most room configurations. 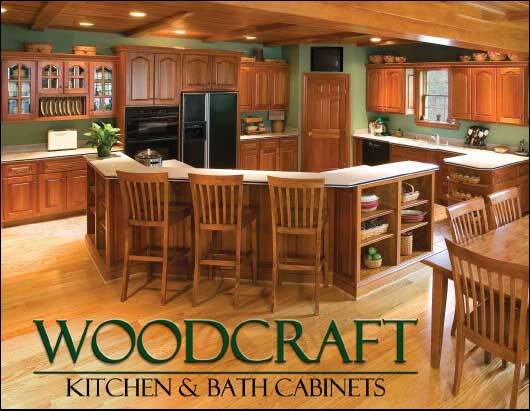 Click here to download a reader friendly version of our Woodcraft kitchen cabinet catalog (4 MB PDF) with details and door styles. 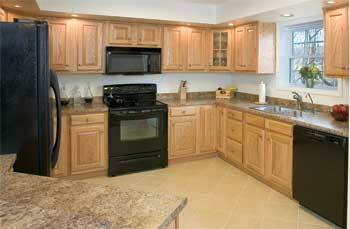 Give us a call - we can make your dream kitchen come true. 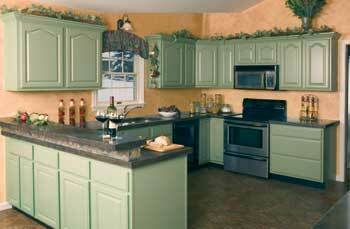 Woodcraft's cabinet doors are as beautiful in appearance as they are in craftsmanship. 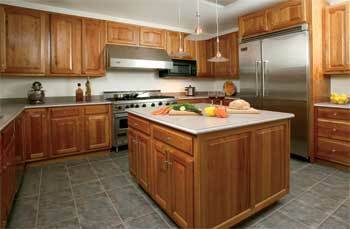 We start with premium grades of 3/4"-thick solid pine, maple, oak and cherry. Rail and stile joints are all glued for superior strength. Our door panels actually float in the frames to accommodate seasonal humidity, ensuring a better fit and durability. Whatever your home style, you're sure to find a door style to complement your décor. A choice of four woods, numerous door styles and an array of decorative hardware options ensure you can create the look and feel you want. Whether you are looking to organize your kitchen workspace to make it more efficient or to create functional storage for food, utensils, and other items, we bring you a broad selection of options to meet your needs. See page 17 of the PDF Catalog for a full list of accessories. Store Your Bathroom Essentials in Style! 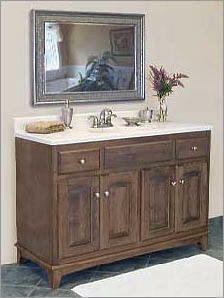 Woodcraft brings the warmth and beauty of real wood into the bathroom with attractive and functional bathroom vanity cabinets. Our line of stylish vanities is available in your choice of wood Pine, Maple Oak or Cherry in Shaker, Mission, Cottage, Provincial, or Hampshire styles.